A hamster with all four of its feet missing has been found dumped in a street in Grangemouth. The female rodent was found alive in a hamster cage on Tuesday morning, but has now been put down. The Scottish SPCA said it had been "shocking" to find the bones exposed on some legs. Vets believe it may have chewed its own feet off. The charity has appealed for information about the hamster. It believes the injuries were quite old. The hamster was in a wire cage with a blue base tray and children's cartoon character stickers on the side. A member of the public found it on the doorstep of a block of flats in the town. 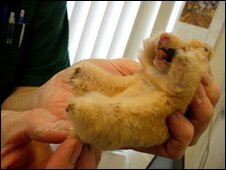 Jennifer Hamilton, from the Scottish SPCA, said: "It's very sad when animals are abandoned, but this was particularly shocking when we discovered that she did not have any feet. "The vet who examined her said that she may have chewed them off herself, but we don't know what would have driven her to do this. Whatever has happened, she must have been in a great deal of pain and her owner should have taken her for vet treatment." Ms Hamilton said the animal's quality of life would have been "severely limited" by the injuries. "It would have been very cruel to allow her to continue struggling in this way," she added. The Scottish SPCA warned that abandoning an animal was a criminal offence.